Photo: Courtesy of Miss Jessie's. For anyone who has relaxed, chemically straightened hair, the process of embracing your natural texture can be daunting — especially if you've been processing your strands for a long time (like, you know, most of your life). As someone who has finally made the choice to stop punishing my hair for my issues — and chemically processing the poor, unsuspecting strands to death — I've learned a lot about this transition. First, I'm not interested in cutting off all my hair. (I'm going two inches at a time.) And, managing mixed textures is its own special kind of adventure. In the spirit of getting through this together, I give you my new favorite secret styling weapon: Miss Jessie's Transitioner's Magic. The leave-in cream is packed with hair-nourishing oils and natural extracts that moisturize growing curls and coat relaxed texture in frizz-fighting protection, all while managing overall curl shrinkage. So, the potion handles both hair textures waging war on your head, leading you gently into the future with a unified coiffure, and keeps your hair supple in the process. The cream works wonders whether you air dry or use a diffuser, so consider it your new everyday must. Transitioning is hard enough, and this product makes it feel like I'm doing it right. Some day I'll come out on the other side with not two but one hair texture. Until then, this tube is helping me maintain my mane, my sanity, and, quite frankly, my vanity. And, that's nothing to flip your hair at. 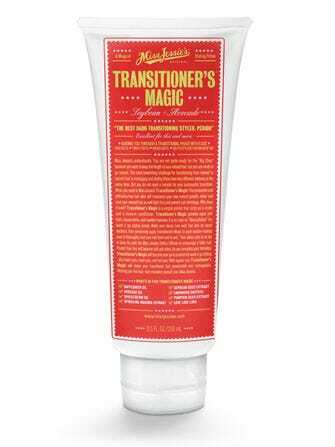 Miss Jessie's Transitioner's Magic, $22, available at Miss Jessie's.